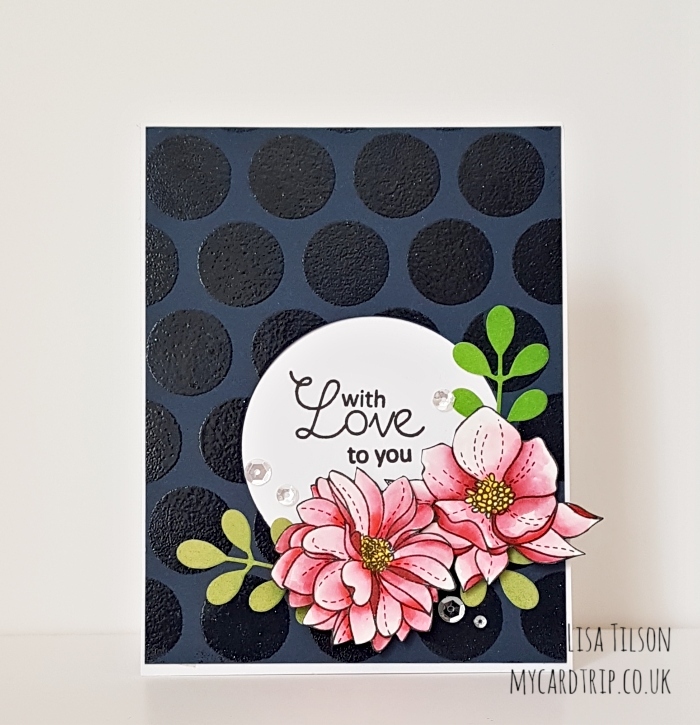 Today I am sharing a card that I made a few weeks back with some “scraps”. I don’t like to throw anything away as you never know when you may need it! So here is my card for today. The background was created with a stencil from Simon Says Stamp and I used a navy cardstock from my stash. The stencil was inked with Versamark ink and then clear embossing powder applied. Once it has been heat set it dries clear but with a lovely gloss. The flowers from SSS Even More Spring Flowers were watercoloured with Zig Clean Color Real Brush markers (colours listed below) and fussy cut. I went around the edges with my Memento Tuxedo Black marker to make sure they look neat and there is no white showing. The foliage was actually from a few years ago, using a leaf column die from SSS that is sadly no longer available for purchase. The foliage had been distress inked with a few greens and had not yet made it onto a card. 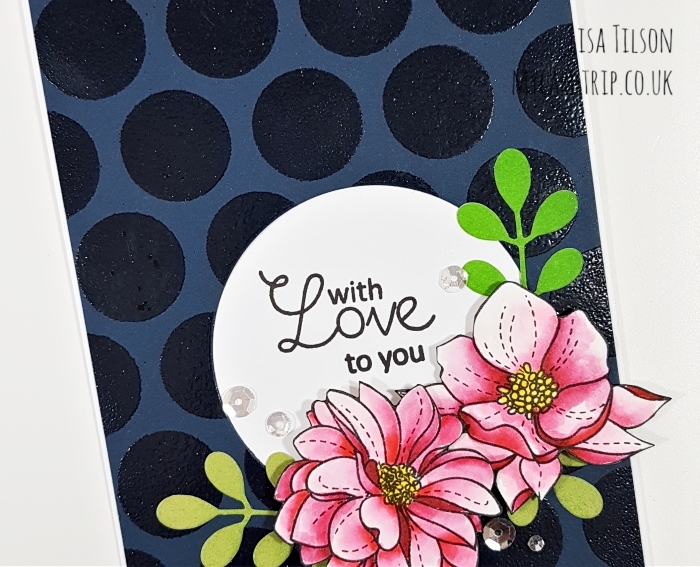 So to create the card, I die cut a circle window from the background panel and then adhered it to an A2 white base using DST. 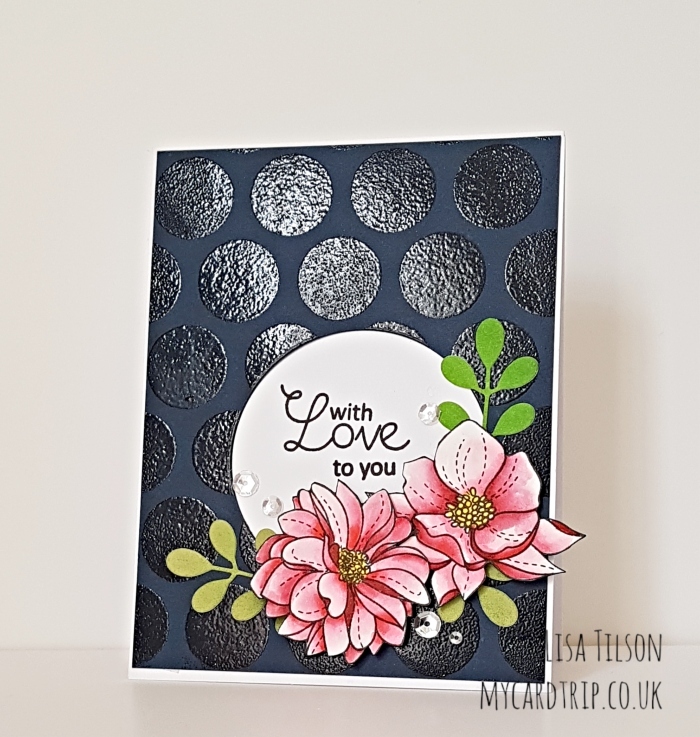 I popped it into my MISTI and stamped the beautiful greeting from Clearly Besotted using Versafine Onyx Black. I then arranged the flowers and foliage around the window to finish it off. These were either popped up with foam tape (sometimes a double layer) or adhered with wet glue. To finish I added a few sequins from Lucy’s Cards. So that finished my card and as those flowers definitely say “Summertime Fun”, I shall enter it into the current SSS Flickr Challenge. Beautiful card, love your flowers.